The amazing and lovely Brenda Kinsel wrote in her book Brenda Kinsel’s Fashion Makeover: 30 Days to Diva Style! 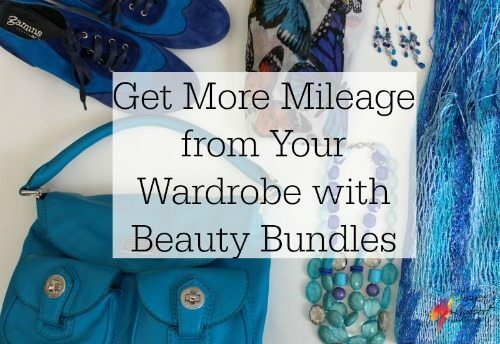 all about the value of the “beauty bundle” as she calls it. 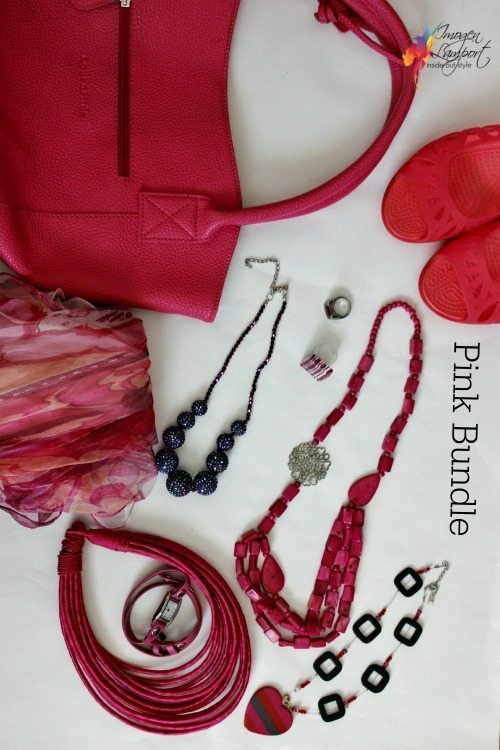 These are bundles of accessories that are in a similar colour that can be worn together to make a neutral outfit more exciting, or even providing some colour contrast with the coloured garments in your wardrobe. Provide the hero elements or just the icing on your sartorial cake. I was reminded of the concept recently (even though I wrote about it years ago here) when Ruth Essex shared her beauty bundles in her Stylish Thoughts post. Now I have naturally been doing this without much thought for years as I collect accessories I can wear together in different combinations in my favourite colours (my signature colours) so I want to share with you the process and some things to think about when creating your own beauty bundles. 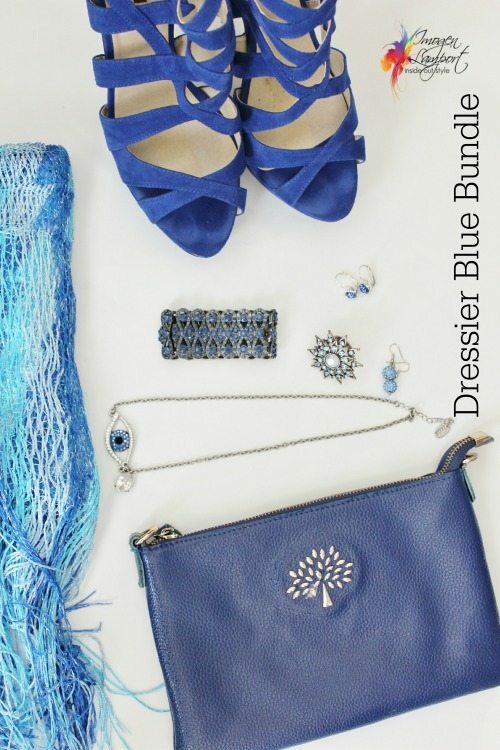 The first one I’m sharing is one of my blue bundles – it’s more daytime focussed, not too much bling. Now here is a slightly dressier bundle with more bling that I may wear in the day, but otherwise can wear at nightime or for dressier occasions. You will notice that I have scarves, a range of jewellery, bags and shoes in each bundle. I can’t and wouldn’t wear everything at the same time. But I need my accessories to work year round. So I will look for pieces to add to each colour grouping so I have options for winter and summer too. You will notice that pink heart necklace that features above in my red bundle, also features in my pink bundle below as it contains both pink and red. When a piece has a couple of colours it can be worn with more items in your wardrobe. This is why I also include what I call a multicoloured bundle. 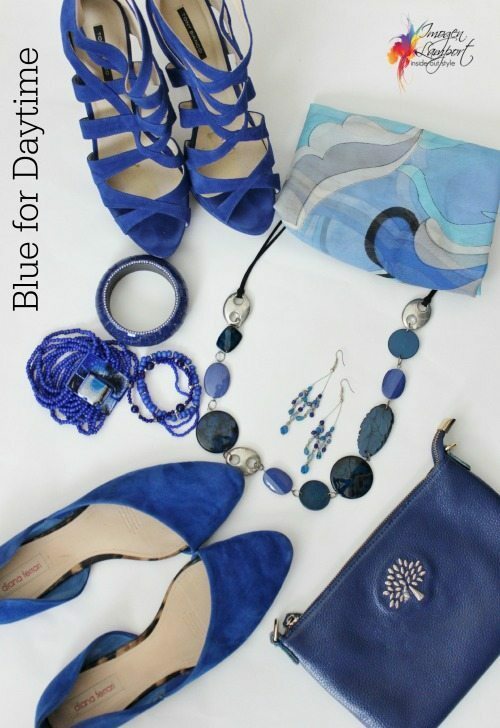 You will notice the same or similar colours repeated in these accessories. I may not wear them all together all the time, but I could happily combine the necklace with the shoes, or the shoes and handbag, the scarf and shoes with the bag depending on my requirements. It just gives me more options to play with and these colours tie back with the garments in my wardrobe. I find that turquoise and teal are two colours that go with so many other colours, so I have quite a collection that can be worn in many ways and that can be mixed with many other colours, from blue to red, pink to purple, this bundle really gets a lot of use! It is so nice of you to mention Brenda Kinsel. I have been a fan of hers since her book “40 Over 40” and had the pleasure of meeting her in person when she came to NYC a few years ago. She has had so many wonderful suggestions and thoughts on how to develop and maintain great style and individuality. Her advice is always given in a positive, enhancing and humorous manner. Brenda is a delight and I adore catching up with her when I’m at AICI conference in the USA! She is so down to earth and delightful and shares her knowledge so generously. A true inspiration! Thank you. The photos are great. After reading your previous posts on Beauty Bundles (Accessory Families on other blogs – I like BB better!) I have changed how my brain thinks about my accessories. I have a couple of blue bags and I now start thinking about what goes with them. Which scarves? Which necklaces? I even started a spreadsheet of my accessories but I haven’t kept it up to date. Winter accessories (woolly hats & gloves) are different to Summer accessories (sun hats) and I have realized today from your blog that there are different levels of refinement for accessories as well. Also I can wear more neutral colored clothes and jazz them up with accessories. But the multi-colored “bundles” you were mentioning were quiet interesting, because I thought they are the opposite – works with less items in ones wardrobe. I love two-toned prints or color-blocked pieces, but I find the non-neutral ones such as a burgundy/black checkered print tricky when it comes to choosing colors to wear these prints/two-tones pieced. How would you color coordinate when it comes to non-neutral two-colored prints? I often pick up a color or two when wearing prints and then toning them down with neutrals, but when there is only one colors available in the print – would it be odd to add another color like mustard or olive with this burgundy/black prints? 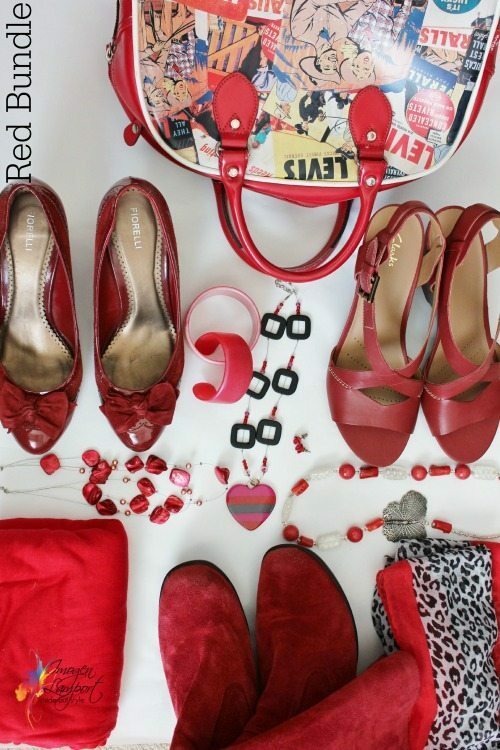 (Mine is an flannel skirt though, not an accessory, though I do have a few red/black/silver plaid accessories, but always get bored when pairing them only with neutrals plus the color appearing in these items). The multi coloured bundles work with both colours – that are contained in the bundles, or neutrals! They work with enough to make them worthwhile. Not everything has to work with everything in your wardrobe all the time. If you had a linking item in your accessory – that say had the burgundy and olive, then you can add more olive accessories, even though it’s otherwise not in the outfit. This post was so timely. I started reading it during a break from actually starting to sort some bundles like these. Please could you do some more, with pics of some wearing options. Getting the combination right without it looking matchy matchy or mismatched isn’t always easy. Yes some more examples would be helpful. I think I have some accessories mismatching going on! I love the idea of accessory bundles. 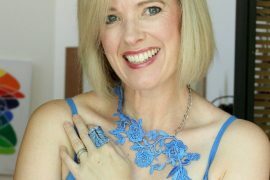 I have recently been finding that I have a “hole” in my accessories as I always find myself looking for a color I don’t have or I have the same accessories I’m tired of wearing and need more to be able to switch things up. How many pieces of each type in a color grouping would you recommend? Imogen, I’d love to know how you store your beauty bundles. Do you keep each bundle together somehow? Just take a photo of each so you know what you have? I can’t picture how to “manage” the bundles. Great idea BTW! I store shoes together, necklaces together, scarves together etc. Then when I decide to wear a colour I find all the pieces I have in that colour and decide which I will choose to wear that day. Imogen, there are many articles on organizing your wardrobe and yet you have so very many clothes compared to me. Can we have a peek at your wardrobe, your shoe order, your jewellery storage, your bundle organisation. I don’t have a single bundle at all. Very boring I know. So, since I am a “neat freak” I wonder how to organise all these ideas. It would have to be a super large jewellery box or do you have those cute frames painted and mounted on a wall and then have hooks and pretty ribbons with butterflies to hold it all. I am really interested to know how our stylist from inside out style organises all this. Please. If you can do it and show me, then I guess I can take a shot at it. 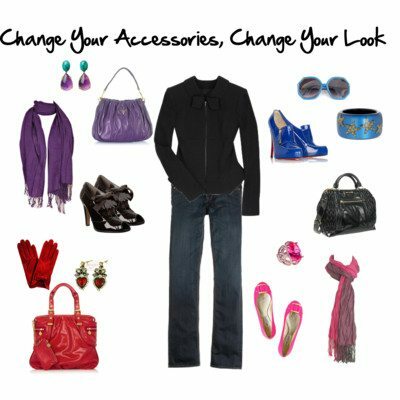 I have tried multiple times to get jewellery and a few handbags that suit and then I think, argh…where and how do I store all this and inevitably, as is my habit for decades, I give it away because I would rather have neatness than beauty,. don’t laugh… told you I was a neat freak. So, could we see how one has all this beauty and pretty co-ordinated outfits and accessories stored? I started working on my bundles a while ago when read an article you did on them. I was wondering how many (signature) colour bundles you have? Wondering if I had too many “signature” colours? Working on red, blue, turquoise, green, pink, orange/peach & charcoal. 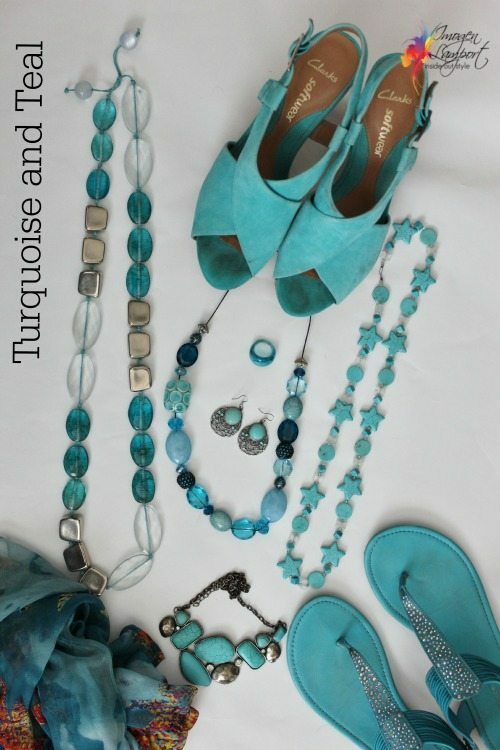 Happy to see you put turquoise & teal together in one :), that will help! Like Lina, I don’t like to mix my metallics, so I try to find coloured jewellery in both gold & silver. Not too many! That just gives you options. Imogen, I love your bundles, particularly the blues and the red ones, but I love, love, love your strappy blue shoes! Could you tell me the brand, and what they are called, if you still have that info, please? Do you know what that particular shade/tone of blue is called?